12 Variations on "Ah, vous dirai-je, Maman" K265 (300e) (12 Variations on Twinkle, Twinkle Little Star). Composed by Wolfgang Amadeus Mozart (1756-1791). Edited by Hans-Christian Mueller. Arranged by Hans-Christian Mueller. 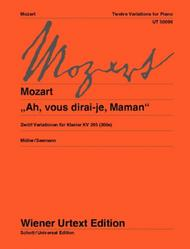 For Ah, Vous Dirai-Je, Maman 12 Variations for Piano. SMP Level 8 (Early Advanced). Standard notation. Published by Wiener Urtext/Vienna Urtext (PR.UT050096).With Standard notation.This title has selections that range in difficulty from SMP Level 7-8.About SMP Level 8 (Early Advanced)4 and 5-note chords spanning more than an octave. Intricate rhythms and melodies.